Perhaps fittingly after visiting the Monkey Forest, we decided to see an evening performance of Kecak - Monkey Chant. We crammed into a minivan for the 30 minute drive to the village of Bona, where the performance was to be held in a dusty Banjar hall. It was very dark in the hall, and very difficult to take any photographs. It definitely seemed to be a village performance, fairly unpolished and simple, which, depending on your point of view, might be considered more "authentic" than a more polished, professional performance. 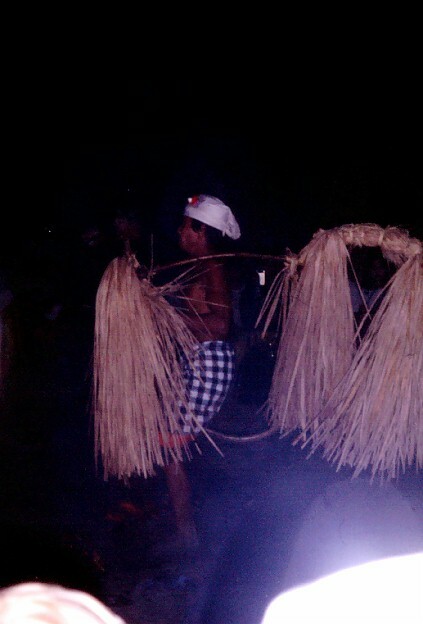 In fact, photographs dating back to 1936 show the kecak being performed in Bona village, so it has been going on here since the beginning. The Kecak is a complex interlocking chant that became stylized early this century as Westerner travelers and artists started to discover Bali. Forms of kecak had been practiced in ritual form as the ancient sanghyang trance dance for centuries, but it was condensed and turned into an entertainment by some of the first European "tourists" to come to Bali - it is said to have been first choreographed by the influential German artist and traveler Walter Spies, who lived in Bali in the 1930's, and the dancer-ethnologist Katharine Edson Mershon. Based on the Ramayana story of the abduction of Sita and her subsequent rescue by an army of monkeys, the monkey chant is performed a cappella by a large "choir" of men, who sit cross-legged in a tight circle forming a huge human mandala. As they chant the singers raise their arms in a sort of seated dance, swaying from side to side, and laying back against each other, all as one, as the mandala comes alive. The choir chatters like monkeys, and croaks like frogs, as the story of Sita's abduction is told. It's quite intense and mesmerizing, as the chant rolls along, the voices rising and falling in unison, as a fast interlocking chatter. From time to time figures, such as Sita herself, Hanuman the king of the monkeys, etc, would appear and act out parts of the story. 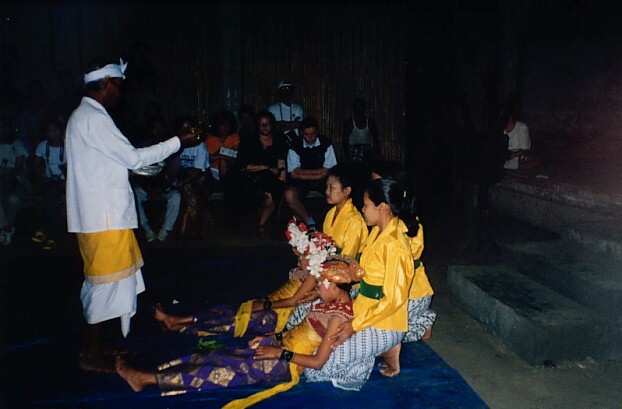 After the kecak, there was a presentation of a "trance dance", with two young girls, supposedly in trance, dancing in a swaying, mesmerized way, and then standing on the shoulders of two men, and swaying back and forth as the gamelan music played. These are the girls in "trance". At the end of the dance the girls "fainted" simultaneously, and were brought out of their trance with holy water from the priest. Finally there was a fire dance - palm debris was piled up on the floor, set ablaze, and then spread out. A man in "trance" and riding a straw hobby-horse ran through the glowing embers, evidently without pain, and then proudly displayed his black but unblistered feet for inspection (next to a tip jar). It all seemed a little contrived to me. I'm sure this happens commonly in true ritual context, but to turn it on every evening for the tourists seemed like more of a re-enactment than the real thing. Back home in the cramped minivan, and looking forward to our trip tomorrow.